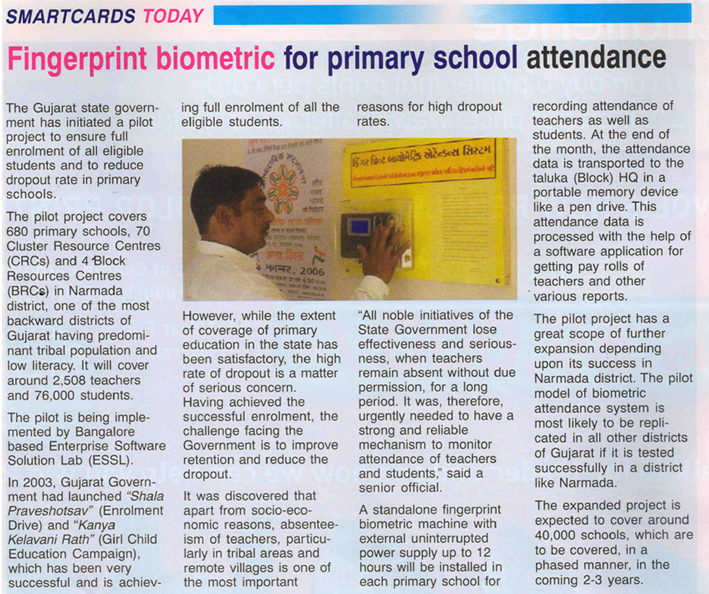 Project Titled : “Fingerprint Biometric Attendance System for Primary Schools in Narmada District (Gujarat)”. To ensure full enrolment of all eligible students and to reduce drop-out rate in primary education, Government of Gujarat launched “Shala Praveshotsav” (Enrolment Drive) and “Kanya Kelavani Rath” (Girl Chid Education Campaign) from the year 2003. This programme has been very successful and is achieving full enrolment of all the eligible students. The extent of coverage of primary education in the state has been satisfactory but high rate of drop-out is a matter of serious concern. In the last three years, the Primary Education Department of Government of Gujarat has introduced several schemes to address the problem of drop-outs. While lots of initiatives are being taken to improve primary education, it is equally important to sustain and deepen these reforms. After the success of enrolment drives with the achievement of full enrolment, the challenge now is to improve retention and reduce the drop-out. Apart from socio-economic reasons, absenteeism of teachers, particularly in tribal areas and remote villages is one of the most important reasons for high dropout rates. All noble initiatives of the State Government lose effectiveness and seriousness, when teachers remain absent without due permission, for a long period. Above entioned areas, which are also the areas of lowest female literacy rates are suffering a lot because of this problem. It is urgently needed to have a strong and reliable mechanism to monitor attendance of teachers and students. In order to have strict watch on the attendance of the teachers and the students, a Fingerprint Biometric School Attendance System was proposed for Narmada District. Government of Gujarat has accepted the proposal and has sanctioned a pilot project of a Fingerprint Biometric Attendance System for all primary schools in Narmada District to be implemented by the District Panchayat – Narmada (Rajpipla). After implementation, Narmada probably will become the first district in the country to cover all primary schools by a Fingerprint Biometric Attendance System. The pilot project is planned to cover 680 primary schools, 70 Cluster Resource Centres (CRCs) and 4 Block Resources Centres (BRCs) in Narmada District. It will cover around 2508 teachers and 76,000 students. A stand alone fingerprint biometric machine with external un-interrupted power supply upto 12 hours will be installed in each primary school for recording attendance of teachers as well as students. At the end of the month, the attendance data will be transported to the taluka (Block) HQ in a portable memory device like a pen drive. This attendance data will be processed with the help of a software application for getting pay rolls of teachers and other various reports. The pilot project has a great scope of further expansion depending upon its success in Narmada district. Narmada district is one of the most backward districts of Gujarat having predominant tribal population and low literacy indicators. The pilot model of biometric attendance system is most likely to be replicated in all other districts of Gujarat if it is tested successful in a district like Narmada. The expanded project is expected to cover around 40,000 schools, which are to be covered, in a phased manner, in the coming 2-3 years. As an implementing agency District Panchayat – Narmada (Rajpipla) has decided that the procurement of the standalone Fingerprint Biometric Machines (FBMs) along with accessories would be through National Competitive Bidding while the software application would be developed by the NIC-Gujarat. To carry out this objective, District Panchayat – Narmada proposes to finalise a rate contract with only manufacturers of Fingerprint Biometric Machines (FBMs) in India for supply, installation and commissioning of standalone FBMs as per specifications given in the tender document.